Over the years many good alternative systems have become available for flat roof replacement and a GRP Flat fibreglass roofing system is what is now generally recommended for use on domestic properties. It is also ideal for balconies as it can cope with a lot of regular foot traffic. Traditionally, domestic flat roofs are usually covered with bitumen felt and have been for many years with some stone chippings or gravel to help protect the felt from the sun damage. This method may look good at first but you soon hear complaints that the gravel fills the gutter and gives moss the ideal conditions in which to grow because the gravel retains the water. As the years go by the hot sun and cold weather makes the felt brittle and that makes it harder for the material to cope with the expansion and contraction that takes place on a roof. Slowly the material begins to crack and leaks start to form. Sometimes these leaks will stay hidden for a long period of time whilst the supporting chipboard acts like a sponge by soaking up the water before drying out again, slowly causing structural damage to the roof timbers. 25 year guarantee to give you peace of mind. If your existing flat roof is letting in water, or if you’re having a new extension built or perhaps wish to re-roof an extension or garage feel free to contact us for a no obligation quote. We are based in Stourbridge but offer services all over the West Midlands and Birmingham for both private and commercial clients throughout. This is why Diamond Fibreglass fit high quality roofing that conforms to building and safety regulations, carries a full guarantee and is installed by trained, comprehensively insured specialists. Whether you’ve got a period property or a brand new development our GRP roofing can be fitted to buildings of any size and is available in a huge range of styles and colours. Ensure that your building looks fantastic and that it stays protected from the elements. If bad weather has damaged your garage roof, or if you’ve noticed a leak, prompt repair will prevent extensive damage to the underlying timbers and masonry to keep the building protected against damp. You’re in safe hands too – we’re covered by comprehensive liability insurance and we’re highly recommended by our clients throughout the West Midlands area. By trusting your new roof installation to Diamond Fibreglass you get a durable and long lasting result for your property. 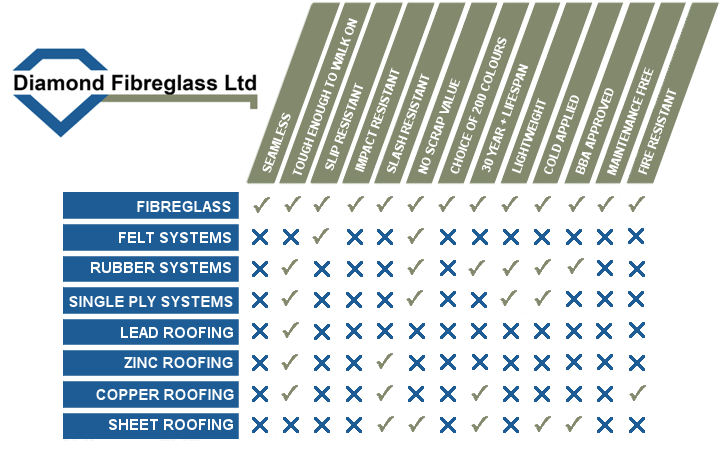 Why choose a fibreglass flat roof? to the more superior ‘Warm Roof’ standard.